In continuing where I left off from Part 1, I will look to quickly fly through the rest of the Historical depictions as I have much more important research to start parsing and presenting. 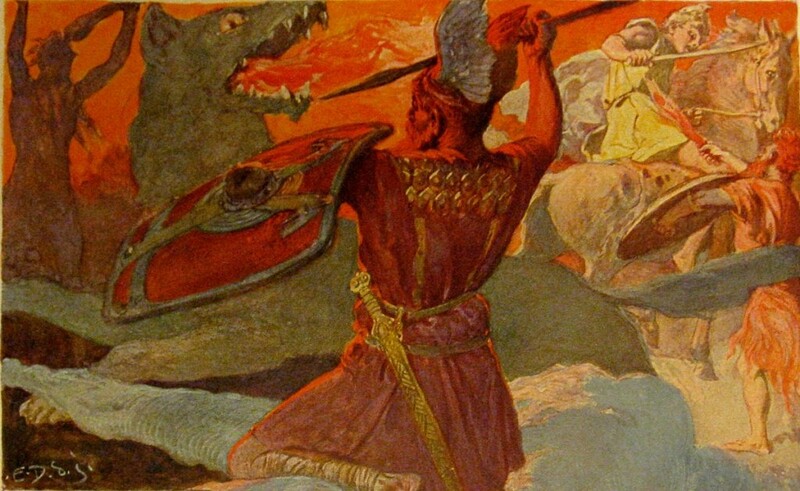 My main reasoning of this post, was to reinforce the proliferation of the “mouth” depiction in these Fenrir\Surma\Garm portrayals and to impart the importance of said proliferation. 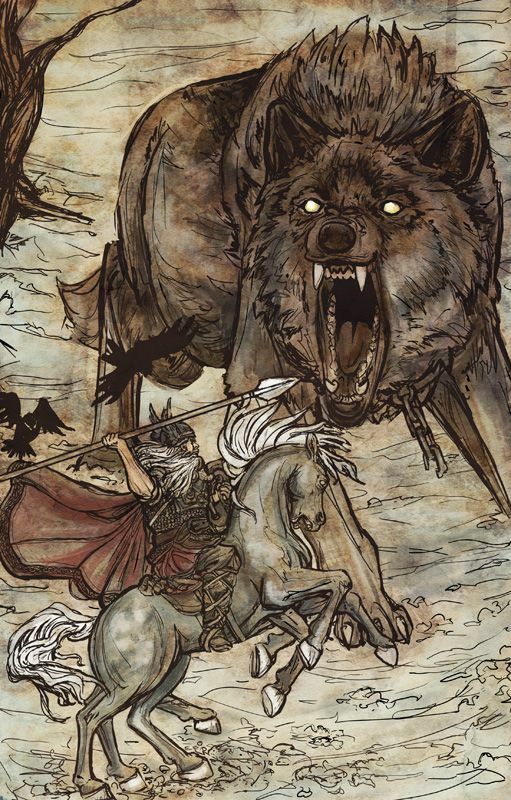 To restate, I believe all these depictions, especially those of the “open mouth” variety, are direct references to the above Fenrir\Surma\Garm Google Map Image. Published in 1882 by F.W. Heine, he offers an outright aggressive, interpretation of FSG’s “mouth”. An approach seemingly mirrored with the “I am not really a Snake but likely a large, real life River that forks” Creature depicted to its right. 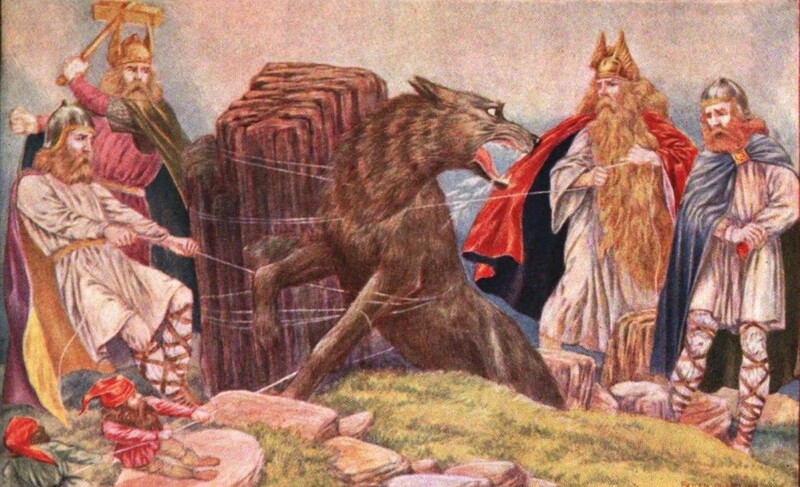 The above is a depiction of FSG at Ragnarok. 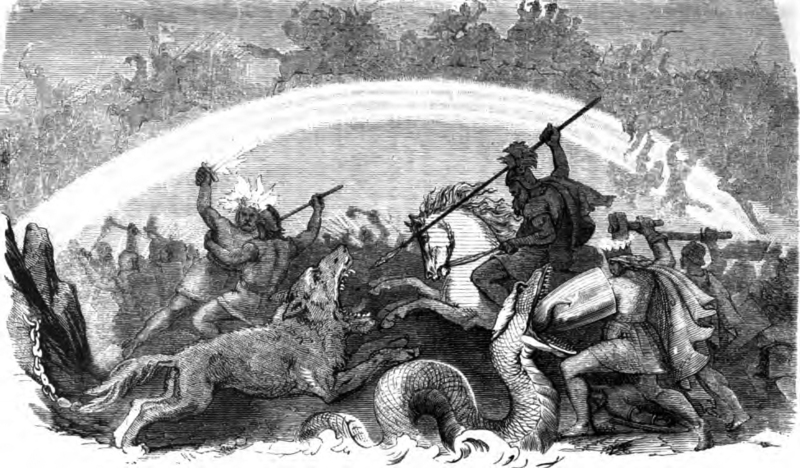 Ragnarok is a mythological series of events that unfold at the End of the World. The fire breathing is an interesting twist to this portrayal. Will have to add “Finland Volcanoes” to the research heap. If volcanic is indeed in play here, it would create a pattern of finding myth related land features near volcanically active areas. Here is another illustration of FSG with a little of his “Binding” imagery depicted. 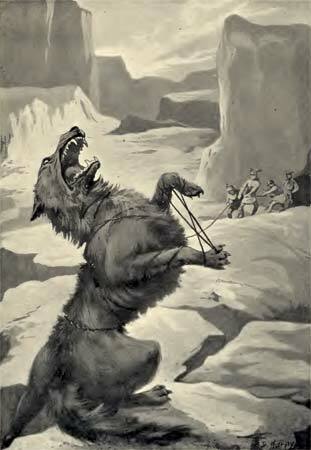 In remembering his original story and what has been depicted here, he was bound and chained to the Earth. Which means in Reality, he is OF the Earth. On the Earth. Meaning, whomever is bound or chained in any of these Myths (looking at you next Andromeda) are more than likely to have an Earthly representation. Something by the way, I have proven twice now with FSG and Prometheus. Both bound\chained myths, both located as an Earth Image\Feature. Another open mouthed rendering with “Binding” themes present. Take special notice of the “Drool” coming out from FSG’s mouth. This will be the topic of conversation in a future FSG post. Yup, you heard that right. I will be breaking down Dog drool in a future blog post and I couldn’t be more excited! More FSG, more “mouth”. Btw, can we assume the Publishers of these pieces had this inside knowledge? Why no Share? Ow right, this truth wont sell many History or Comic books or “Clash of the Titans” and “Lord of the Ring” movies. This final picture was published in 1908 by W,G. 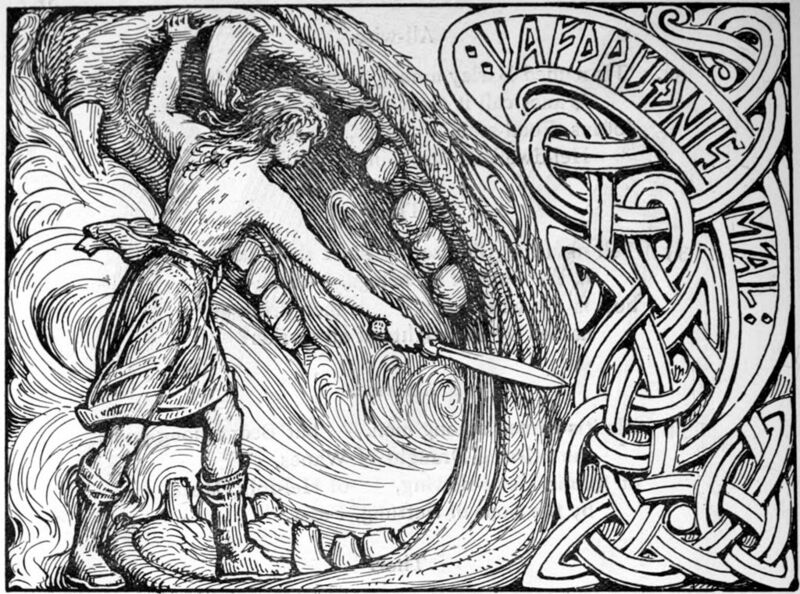 Collingwood of Vidar slaying FSG. The “mouth” area is again emphasized in a dominant manner in contrast to the other subjects depicted. LOOK AT MY MOUTH is the common and by implication, the most important theme present in all of these renderings. We get it! Its important. Not what does it all mean? Its means, we now move onto the next part of my circumstantial case and one step closer to hopefully having an answer to “WDIAM?”. Next….Hey FSG’s Lower Jaw, Why so broken? And have they chronicled your “broken” pain throughout History?